Air-dry clay is a wonderful alternative to more traditional forms of clay, as you don’t need to bake it at high temperatures in an oven or kiln for it to set. Therefore, it’s quick and easy to use, plus children will love working with it! When it comes to creating things with this humble little clay, the project options are absolutely endless. Whether you want something for your garden, desk, Christmas tree, or fridge (among many other things), the list below pretty much covers it all! This simple yet stunning DIY clay votive from A Beautiful Mess is the perfect décor item to add that subtle candlelight glow to your space. With Christmas just around the corner, it’d even make a great gift for a loved one! 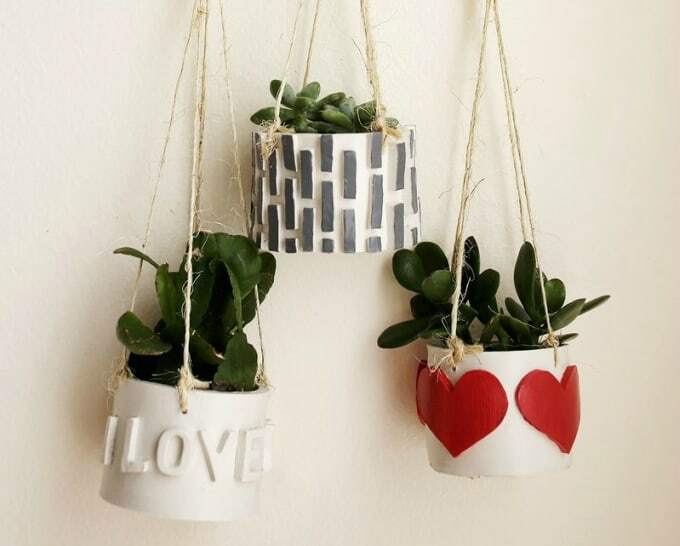 If you’re stuck for space outdoors, or live in an apartment, this DIY hanging plant pot project from A Beautiful Mess is for you! Using air-dry clay to create these is fast and easy too. Here’s a DIY craft project that even your kids will want to tackle on the weekend – making a minion using colorful air-dry clay! It’s a genius idea from the Air-Dry Clay Blog. When it comes to decorating your space, you just can’t look past these DIY air-dry clay birds from Alicia Sivert. You can paint them in any way you see fit too, so the various patterns are endless! These air-dry clay plant pots are designed especially for air plants, so it’s a simple craft and gardening solution all in one! Alisa Burke has this wonderful step-by-step guide for you to follow. This clay pendant tutorial using air-dry clay from Brit + Co is simply genius – Who knew it was that easy to create something like this? The best part is that you can also decorate them in any way you see fit to match your surroundings. Here’s a quick solution for a birthday or Christmas present – these DIY air-dry clay beads from Curly Made. Thread them on a chain or even some string and you’re good to go! Many people seem to have a succulent in their home or garden these days, so why not create these DIY stamped clay succulent pots using the simple air-dry variety, just as Damask Love has done? It’ll save you time and money instead of buying similar styles in a high-end home store. This geometric clay heart pendant from Delia Creates is truly something. 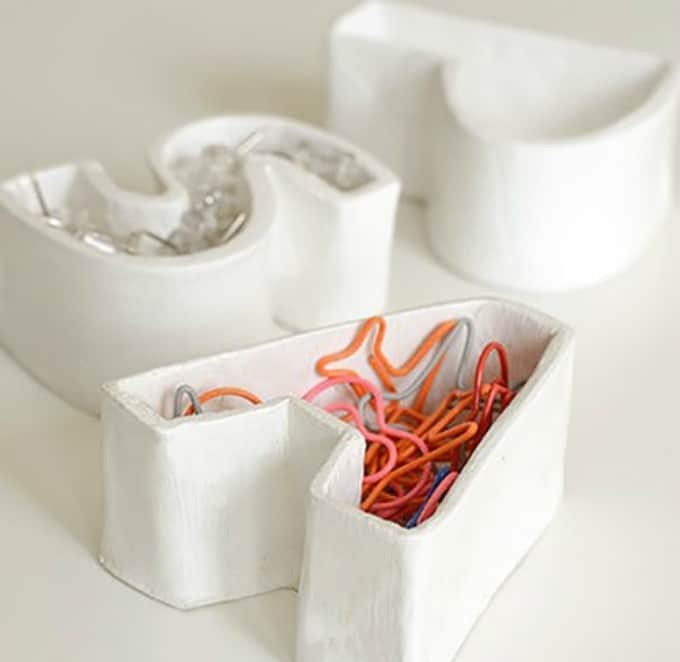 Using air-dry clay means you won’t have to spend time waiting for it to bake, so it’s a clever and crafty idea for creating one-of-a-kind jewelry. 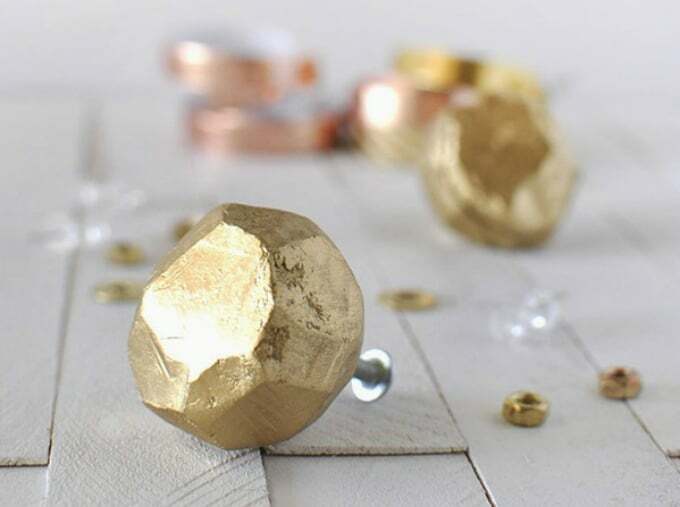 These beautiful gold door knobs from Delineate Your Dwelling are incredibly inexpensive to create using air-dry clay. They’re the perfect way to jazz-up your dresser or even to makeover every door in your home! 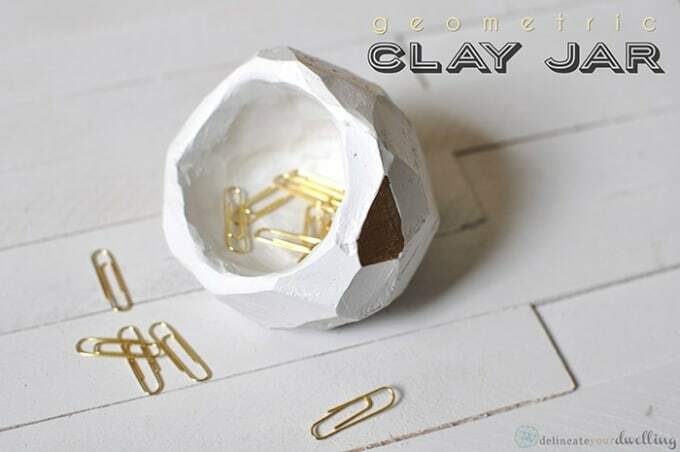 This geometric air-dry clay jar from Delineate Your Dwelling is ultra-modern and eye-catching. It’s the perfect accessory for your desk or workspace! If you find yourself with some spare time this weekend, why not whip-up one of these DIY air-dry clay animal heads? They’re a fun alternative to wall art and look stunning when painted in gold, just as Delineate Your Dwellings has done. How cute are these DIY plant pockets from Design Love Fest? They’re the perfect addition to your wall and they also look great filled with some air plants or mini succulents. These DIY lacey clay containers are incredibly beautiful and easy to create! Design Mom has her step-by-step guide to making these, so be sure to check it out! This modern clay wind charm can be achieved in a day thanks to the simple material of air-dry clay. Design Sponge came up with this brilliant design, and she also shares her fun tutorial with you. This bright-tipped faux antler was created using air-dry clay – Can you believe that? Fall For DIY has certainly come up with a winner here! These DIY incense holders are like nothing we have seen before and we love their simple yet modern look. Fall For DIY has the full tutorial, and don’t forget that you can also mix and match your own desired colors when creating these. Here’s another fantastic air-dry clay craft project from Fall For DIY – a clay egg carton which is perfect for storing jewelry! Now this is something you can tackle within an hour or two…how great is that? Gathering Beauty ticks all of the boxes with these air-dry clay coasters – They even have gorgeous imprints in them! The gold edges really give them a high-end and luxe look too. If you’re looking for an easy craft project to store your dainty tea lights in, look no further than this air-dry clay tutorial from Gathering Beauty! You’ll love the step-by-step instructions too. These cute tea bag holders from Handmade Charlotte will be a favorite DIY project for many children and adults alike! Created using air-dry clay, there’s also no need to fire up the oven or kiln. Here’s another beautiful DIY project using air-dry clay that you’re going to love! These cloud magnets from HGTV are not only adorable, they’re also fun to make too. Here’s some more eye-catching DIY coasters using air-dry clay, this time from It’s Pretty Nice. These ones even use Sharpie pens, so they really are simple and quick to create. 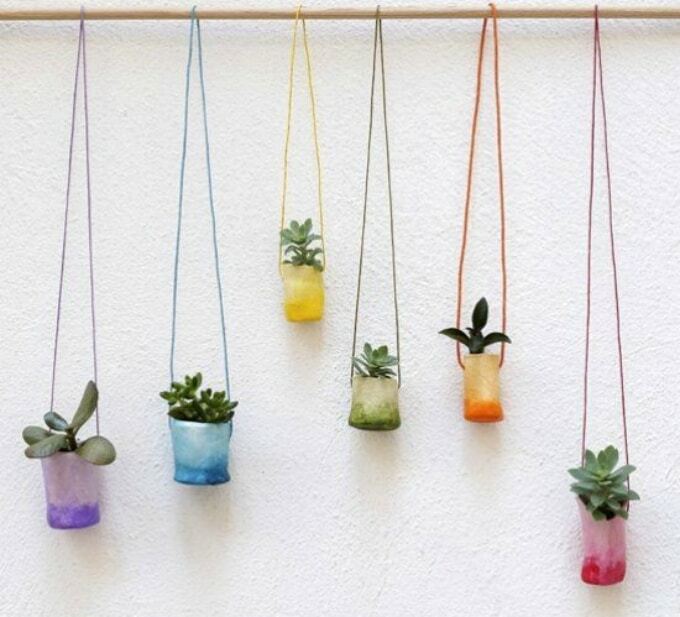 These air-clay hanging plant pots can be created in all of the colors of the rainbow! 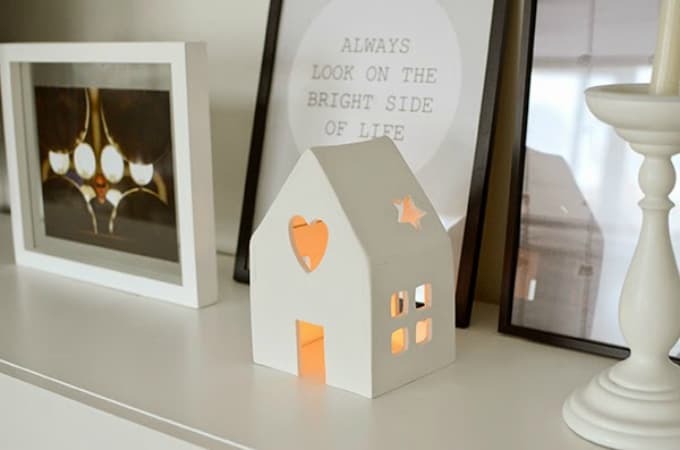 Journey Creativity has come up with this brilliant craft project that you’re sure to love. 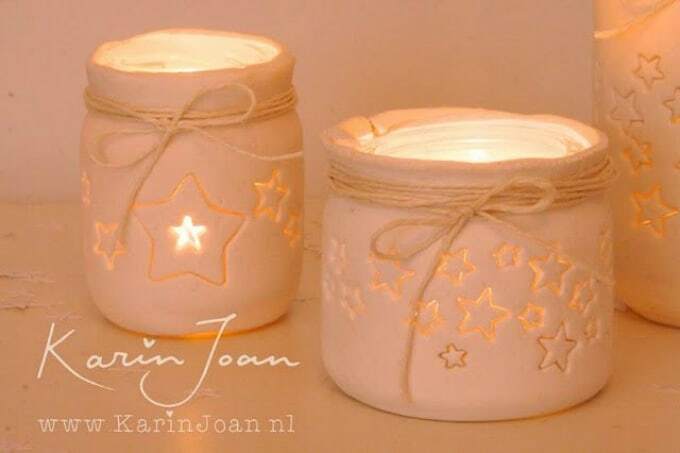 These DIY star jar candle holders by Karin Joan even come complete with a video tutorial so you can watch them being made step-by-step! These are another perfect project to create just in time for the festive season. Here’s another festive creation which also looks beautiful when displayed all year round. La Chica de la Casa de Caramelo will show you how it’s done! Your kids will love displaying their colored pencils in one of these DIY air-dry clay pencil holders from Lines Across. It’s also a great way to add some color to their desk! 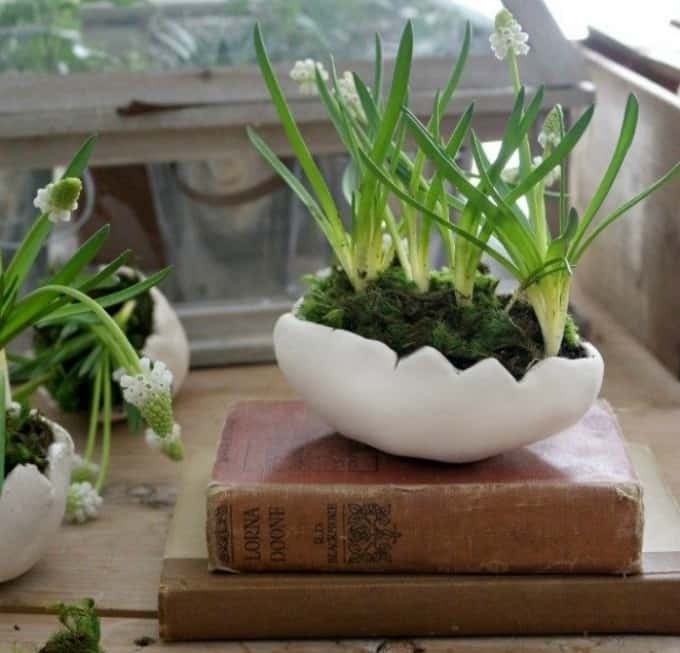 These DIY air-dry clay egg plant pots from Magnolia Homes are pretty special. They’ll give your indoor garden a Jurassic park inspired look! There’s a reason why these clay gift tags from Mahalolena are incredibly popular online – just look at how beautiful they are! The best bit is they were actually made using air-dry clay, so there’s no need to use your oven. An animal-friendly alternative to the more traditional mounted deer head, this DIY project from Make Haus is fun and on-trend. We love the fact that sticks were used as the antlers – They look amazing when painted gold! These rustic bowls look fantastic when painted in crisp white. Make Zine has the wonderful tutorial for this crafty project using air-dry clay. 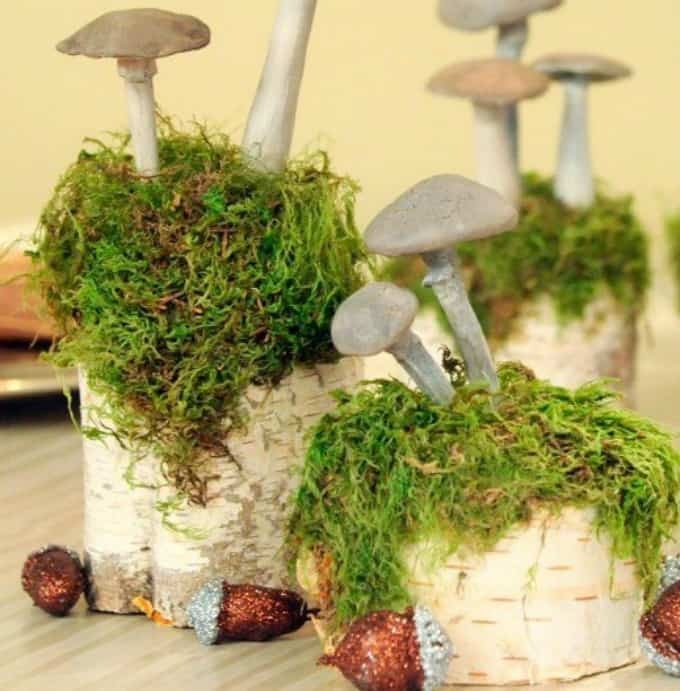 These mushroom table decorations from Martha Stewart will be the talking point of any celebration! Guest won’t realize just how easy they were to create either. You can also create beautiful bunting using air-dry clay, just as Nurture Store has done! These would also be lovely as a special Christmas present for a loved one. Add some whimsy to your Christmas tree this year with these DIY air-dry clay ornaments, created by The Lovely Drawer. This clever and crafty tutorial is a great go-to guide. Spell out your initials or even a word by creating these clay alphabet containers. They’re incredibly impressive, so you’ll want to check out Willow Day’s tutorial to see how it’s done! There you have it! Which air-dry clay projects would you love to make? We’d love to hear your thoughts in the comments section below.